1927 Steinway M (5’7″) Restored $29,995 SOLD! 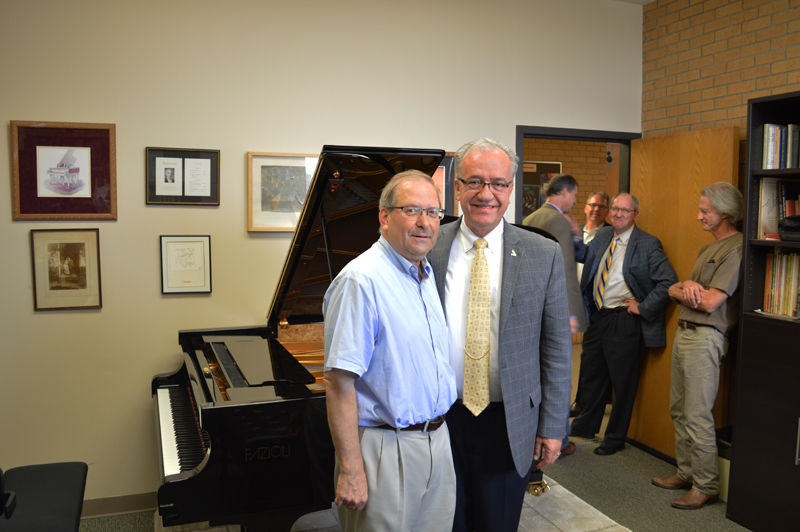 Pictured here with the Fazioli from left to right is Dr. Steven Harlos, Chair of Keyboard Studies, UNT and Dr. John Richmond, Dean of College of Music, UNT. 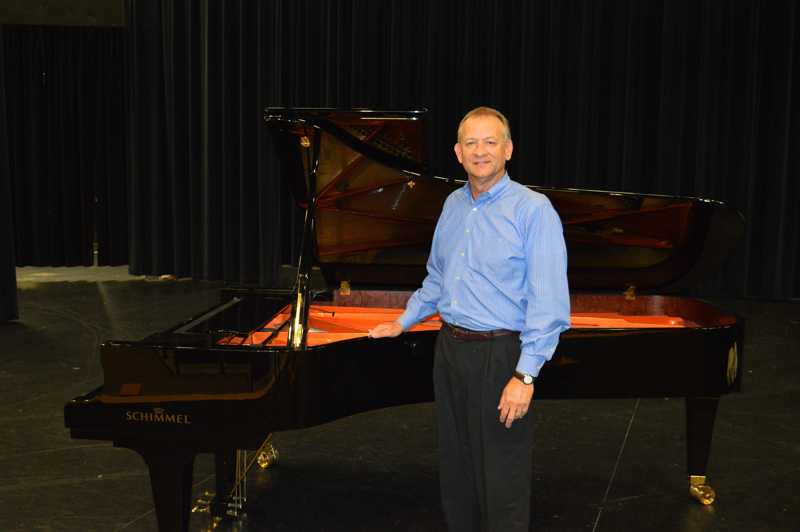 Pictured with the piano is Headmaster, Dave Delph who had this to say about the piano. 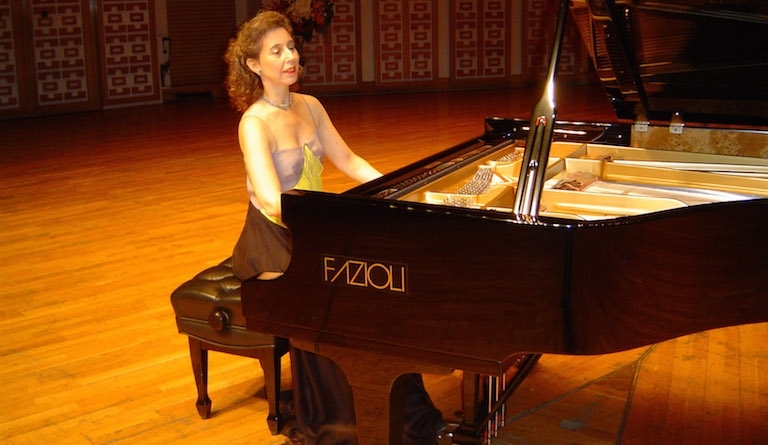 A true citizen of the world, pianist Angela Hewitt was born on Canada, lives in London, runs a music festival in Italy, and excels in music of many types but notably in the works of the great German kapellmeister J S Bach. And it is with Bach that she is currently undertaking a great Odyssey, performing all the composer’s major keyboard works in recitals over five years at Wigmore Hall. Her special relationship with Bach was sealed by a landmark recording of the endlessly fascinating and inventive Well-Tempered Clavier in 2008, its 24 separate pieces experimenting with every key in the chromatic scale. Now comes an acclaimed recording of Bach’s Goldberg Variations, another musical marathon, revisited 16 years after she first recorded it, and played with a new spirit born out of maturity. At 58 she is hugely in demand as a soloist in the great concertos too, with engagements worldwide. And wherever possible, she has a travelling companion – her specially made Fazioli piano. This stupendous instrument with four pedals – Hewitt also turns the page of her electronic musical score with her feet, dispensing with the need for a human page turner – comes from the Italian piano makers who have given the established stars in their field, Steinway and Bechstein, a real run for their money. Set up as recently as 1981 compared with Steinway’s and Bechstein’s 1853, Fazioli is the brainchild of pianist and engineer Paolo Fazioli. Making only 100 or so instruments a year, Fazioli has already become a byword for superb pianism, thanks to its ringing tone. Little wonder then, perhaps, at Hewitt is at home in Italy where her annual Trasimeno Festival in Umbria attracts other world-class musicians. She is also the soloist in Beethoven’s Piano Concerto No 4 (26 Feb) with the Vienna Tonkünstler Orchestra at Cadogan Hall, in a programme that also includes Dvorak’s Symphony No 9 (From The New World). This is one of three concerts by the prestigious orchestra, who return to Cadogan Hall with Mendelssohn and Sibelius (28 Feb) and Mozart, Schubert and Brahms (2 Mar). The Viennese musicians’ residency is part of the Zurich International Concert Series. Beyond that, one of the busiest players on the circuit is sure to be back in her home city soon, and Culture Whisper will be there. IN 1980 a Roman engineer and pianist, Paolo Fazioli, made what most of his friends considered a foolish decision. He opened a piano factory, and not one making cheap pianos for children. Mr Fazioli planned to make the world’s best pianos. The market for high-end pianos has been dominated for so long by the German-American Steinway brand that nobody thought Mr Fazioli would be able to sell even more expensive ones. The only successful new entrants into the grand-piano market have been companies like Yamaha, a Japanese brand, which sold a cheaper product. To build his factory, Mr Fazioli moved from Rome to Sacile, near Venice and, more important, near the Val di Fiemme, known as the “musical forest” for spruce trees yielding especially resonant wood. Antonio Stradivari made his violins from it three centuries ago. Using his engineering skills, Mr Fazioli set about designing a grand piano that would produce a sound superior to any other piano. Today Mr Fazioli’s factory—more accurately, a hall filled with craftsmen and their tools—runs at full capacity, turning out 140 grand pianos a year. Because they are made to order, customers have to wait between four and eight months for delivery of the instruments, for which they are prepared to pay as much as $200,000. So large is the demand that Mr Fazioli is increasing the size of the factory to make 160-170 pianos a year. Stephen Carver is head piano technician at the Juilliard School in New York which, with 275 pianos, is the world’s largest owner of Steinway grands. That makes him an important arbiter in the debate about pianos’ attributes and financial value. “Fazioli pianos are very well-crafted and have a clear, bell-like presence and an even line of sound,” Mr Carver explains. “Steinways have a darker colour, which some people would call richer than the Fazioli sound.” Steinways, Mr Carver adds, also vary in quality and are slightly harder to play than Faziolis. 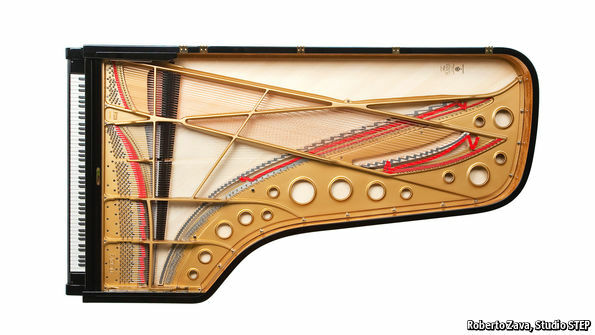 Some 97% of Juilliard’s pianos are Steinways. It also owns several Yamahas. In a major victory for the Italians, though, Juilliard bought a Fazioli piano five years ago and has two more on order for this year. Even with output of 170 pianos, Fazioli will never defeat Steinway, which makes about 2,000-2,500 a year, with grand pianos starting at $63,000. Mr Fazioli, by contrast, considers his firm a boutique instrument-maker. The company exports almost all its pianos, with Europe being the main market, followed by America, Canada, China, Japan and other Asian countries, including Thailand and Indonesia. Pianos are a growing business again. In 2014, the latest year for which details are available, the American market saw an increase in sales from $293m to $304m, according to the National Association of Music Merchants (NAMM). Although still not back to their levels before the financial crisis, piano sales in America have increased every year since 2009. And newly rich Chinese consumers present a golden opportunity for high-end instrument makers. According to NAMM, exports to China have shown constant growth over the decade to 2014. In 2014 China imported nearly 6,000 grand pianos, up from fewer than 2,000 in 2005. Even so, the company struggles with something of an arriviste aura among the best performers. “Fazioli are not catching on as fast among concert pianists as among the general public,” says Mr Carver. “There’s some issue of psychology there; people are resistant to change.” He also points to Steinway’s impressive marketing. “Steinway has managed to establish itself as an instantly recognisable top brand, even though there are other piano-makers that have been making excellent instruments for as long.” Bösendorfer, an esteemed but struggling Austrian maker, was acquired by Yamaha eight years ago. Back in Sacile, Mr Fazioli recently dreamt up a new way of addressing the doubters. Using specially developed software, he is reproducing recordings of now-dead pianists such as Glenn Gould as they would sound if they had performed on Fazioli pianos. Still, he insists, he will never beg famous pianists to use his instruments. Instead he promises to “convince only through quality”. The Stony Brook Music Department faculty and students surround a Bosendorfer Imperial Grand Piano, donated by The Joel Foundation. From back to front are: Christina Dahl, Associate Professor of Piano; Perry Goldstein, Chair, Department of Music; Elizabeth Dorman, Piano Master’s Student; Gilbert Kalish, Distinguished Professor, Piano; Annie Brooks, Piano Masters Student; and David Brooks, (DMA). STONY BROOK, N.Y., December 23, 2013 –Grammy Award-winning artist and recent Kennedy Center Honoree, Billy Joel, through The Joel Foundation, has once again generously provided for students and faculty in Stony Brook Music Department by donating another premiere concert piano; this time it’s a Bosendorfer Imperial Grand Piano, considered the “Rolls Royce” of pianos. The Bosendorfer Imperial Grand Piano was a gift from The Joel Foundation. The Bosendorfer has nine more keys than a conventional piano, which enables a completely new octave and elicits a huge, rich, luxurious tone. Worth $250,000, the high-end concert grand piano is housed in Staller Center recital hall where it has been played by members of the piano faculty and piano students in the graduate program. The gift was made possible by The Joel Foundation that provides music scholarships, gifts and endowments to institutions across the East coast. The Bosendorfer has nine more keys than a conventional piano. About The Joel Foundation: The Joel Foundation was established to provide seed money, musical scholarships, and endowments to a variety of East Coast colleges, universities and music schools. Awards and scholarships provided by the Fund are announced at the discretion of individual institutions.